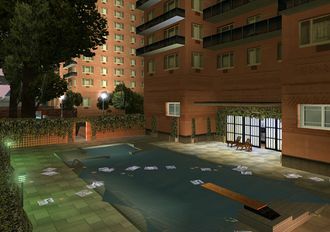 The compound of Asuka Kasen's Condo in GTA III, home of Asuka Kasen circa 2001. Asuka Kasen's Condo is the home of Asuka Kasen, co-leader of the Yakuza in Liberty City in Grand Theft Auto III. The building is located in the district of Newport, Staunton Island, close to a dock in view of Portland. Following "Last Requests", the condo becomes a home to Maria Latore, after she moves to Staunton Island with Claude to escape the Leone Family and Don Salvatore Leone, and is the base for Asuka Kasen's early missions in Grand Theft Auto III. The compound consists of nothing more than a porch overlooking Southern Portland, containing a covered swimming pool, a pair of sunloungers and an entrance into the apartment building, which interior consists of only a simple flooring and wall. The condo is similar to another apartment across the parking lot to the south, though that condo's patio features a different railing, swimming pool, and entrace door. The entrances into the condos' compounds also bears dragon-like signage, similar to the Yakuza's gang logo during early development of GTA III. Near the compound are 2 parking lots. One surrounds the 2 apartments and contains a Blista and 2 Yakuza Stingers. The other one is located west of the apartments. It will contain a Landstalker and a Banshee. Two Marinas are also located near the apartment. The one closest to the compound will have a Reefer and a Speeder docked there. The other one will have a Predator and another Reefer docked there. Aerial render of Asuka Kasen's Condo. This page was last modified on 27 November 2011, at 05:31.